Frenkie De Jong is joining FC Barcelona. One of the most promising midfielders in Europe, the 21 year old has already proved time and again that he is an ideal candidate to slot into the famous Barça style. Technically gifted he can play as a defensive midfielder, where he is perfect for getting the ball moving up-field on the ground, but he can also operate anywhere else in the middle of the park, with exquisite through balls to the forwards being one of his finest specialities. De Jong thus becomes the 20th player from his country to don the Barça colours, continuing a long tradition that ties in with the playing style for which the Catalan club is famed all around the world. Back in the 1970s, coach Rinus Michels played a pivotal role in fostering the lively, attacking approach to the game, with Johan Cruyff being the finest exponent of the art on the field of play. His methods, including the presence of the ball in all aspects of training, even when focusing purely on fitness, are still used throughout the Barça academy through to the professionals. In 1974, it was the 'Total Football' revolution that led Barça to its first league championship in fourteen years, while the whole world marvelled at the Holland team, managed by Michels and with Cruyff on the pitch, dubbed the Clockwork Orange at the 1974 World Cup. Although Holland lost the finals in both 1974 and 1978, the football they played earned respect in every continent. After a few years of experimentation with the model, Cruyff later returned to FC Barcelona, this time as manager, and his Dream Team (1990-1996) marked a turning point in club history, with the conquest of its first ever European crown at Wembley in 1992 and an unprecedented four league titles in a row. The huge success that has come to Barcelona over the best part of three decades owes a lot to Ajax, another of the traditional giants of European football, winners of four European Cups, and provider of so much talent to the Dutch national team, and also to the Catalan club. After the success under Cruyff, his compatriot Frank Rijkaard then built a team around Dutch talent that won the Champions League in Paris in 2006, while Cruyff’s ‘disciple’ Pep Guardiola took things to an even higher level with what some people believe to be the finest football team ever assembled, winner of 14 titles in four glittering seasons, including two Champions Leagues in 2009 (Rome) and 2011 (Wembley). The coaches that have followed have stayed faithful to that style, with Leo Messi the flagship player throughout. 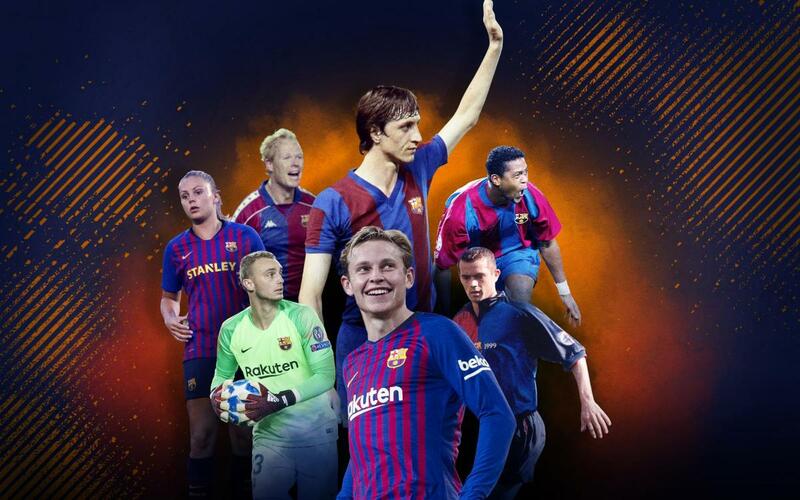 It’s a kind of football that has put Barça and its amazing academy in the global limelight, and the arrival of such a bright young talent as De Jong shows that we will still be enjoying the magic for many more years to come.